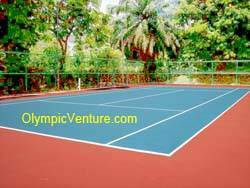 Installed 1 Fibre Reinforced FlexiCourt Coating multipurpose court in Sg. Dua, Butterworth, Penang (February 2010). 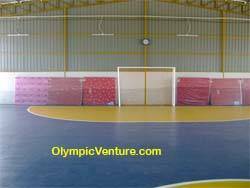 Installed 2 Olymflex rubberized futsal courts in Sg. Petani, Kedah (February 2010). 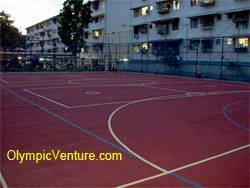 Installed 1 Fibre Reinforced Tennis Court using Plexipave Coating System in Menara Bangsar Condominium, Bangsar, Kuala Lumpur (February 2010). 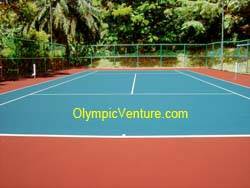 1 Tennis Court using Plexipave. Another view of the Plexipave tennis court. Installed 1 multi-purpose court (coating cushion) Fiber Reinforced FlexiCourt in Bukit Gedong, Bayan Baru, Penang (March 2010). Recoat 2 indoor tennis courts for Tropicana Golf Club using Plexipave Coating System, Kuala Lumpur (March 2010).